Gardeners with small spaces or in urban areas use portable and mini greenhouses to participate and to extend their growing season. Urban gardeners and gardeners with smaller spaces can utilize portable cold frames and greenhouse structures for their container gardens. Even gardeners with lots of space benefit from the versatility of portable grow racks and flower houses. Some hobby gardeners truly enjoy pop up flower houses. Pop up flower houses are known for how easy they are to use and to assemble. They are temporary, small, and portable structures that can be brought out every year and used again. They quite literally “pop up” like a tent while being assembled. They require no building skills or tools. Once the flower house is open, gardeners place plant pots inside the door. The structure provides protection and warmth to the growing plants. In the Fall, pop up flower houses can be wiped out with a sponge and stored for next year. Grow racks are easy to find and to use. Grow racks are portable structures sold as complete greenhouse kits with shelves and a plastic greenhouse cover. Grow Racks are usually about a couple of feet long and a foot or so wide, and are available in different heights. A six foot high Grow Rack will typically have four removable shelves. There are also shorter two and three shelf varieties. The plastic cover is fitted and therefore the kits are not interchangeable. Set up a grow rack on the patio or deck. Grow racks need access to sun and warmth; the plastic cover is easily removed and replaced using zippers. Shade cloths for grow racks are available and advisable for patio gardeners who live in extremely sunny, hot areas. A cold frame is essentially a raised bed with a lid. Cold frames can be either portable or part of a gardener’s backyard landscape. When planning a portable cold frame, remember that the bottom must be perforated for proper drainage. When setting up a cold frame on a porch or patio, place a large enough tray underneath to catch the draining water. Permanent cold frames are built on the ground the same as a raised bed. Cold frames are deeper than raised beds to accommodate growing plants under the hinged lid. Some cold frames have domed lids to give plants additional space for upward growth. An attached greenhouse is attached to the gardener’s house. The outside wall of the home is one side of the greenhouse. Attached greenhouses are usually built on the South wall to get the most possible light and warmth from the sun. Lean-tos and attached greenhouses are synonymous. A mini lean-to, however, is a portable structure. Mini lean-tos are smaller than attached greenhouses, the same shape, and sit well next to the outside wall of the gardener’s home. They can be set up next to the wall on a patio, deck or porch. 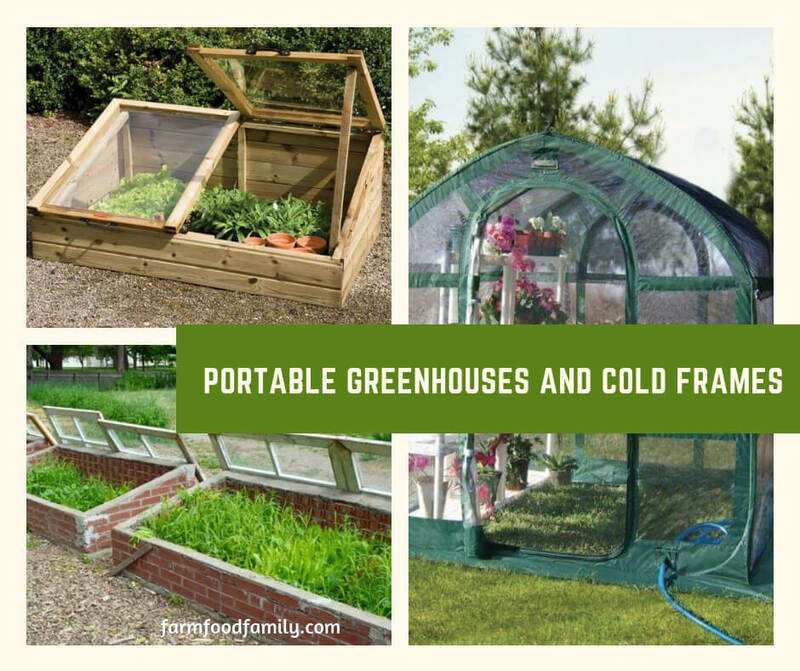 With a variety of portable greenhouses available, even gardeners with the smallest spaces can enjoy the benefits of greenhouses and extend their growing season.